I doubt egg rolls need any introduction. They are popular as a starter in all Chinese restaurants. If you can buy a pack of egg roll wrappers from the store then its a quick snack you can have ready in minutes. They are great to treat an unexpected guest or even cheer up you kids on short notice, at home. Have fun biting into the crispy rolls bursting with a savory cabbage filling. Egg roll looks so perfect and delicious..pics looks great!! Oh this is so tempting and great click!! Egg rolls look lovely and crispy. excellent click..egg rolls looks so crispy and yummy!! Yummy yummy egg rolls....they look crispy and perfect. ithu poleyulla egg roll njan famous magzns le kandittullu! lovely yum and perfect egg rolls. Mmmm...I would love to snack on that! It looks nice and crispy! They look very crunchy and yummy! Wow,egg rolls looks so pretty and lovely presentation as well! What a beautiful picture! Now I'm craving egg rolls! Looks delicious! I can eat this everyday. It is such a versatile dish depending on the filling we are using. great work! wow! I can't believe you made these and they look PERFECT! These looks so delicious, and I can't believe how easy! I'm going to check to see if they have the wrappers at my store. It looks so beautiful. I'm going to try this. The perfect rolls...im drolling dear! Beautifully presented egg rolls... Looks fantastic! Good idea! Thanks for the post. I like your photos as well. Excellent photos. The egg rolls look amazing. These egg rolls look smashing and delicious to boot! Mmm...this is delicious and healthy. This look crunchy and yummy! Such pretty and delicious egg rolls! Perfect for tea time, crispy and crunchy! Crunchy and Mouth watering !! Nice closeup click !! 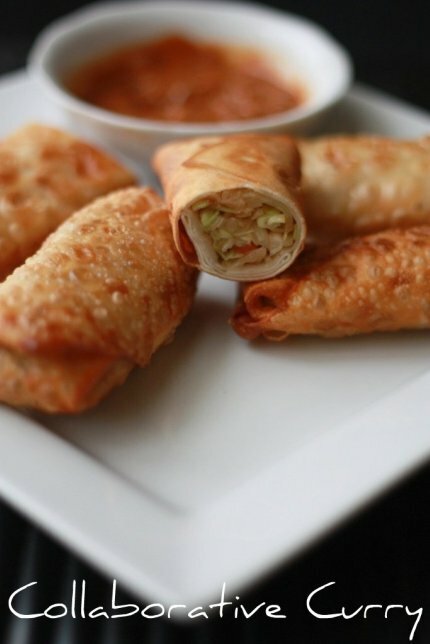 I want some of these egg rolls, look amazing! Looks great, good crispy and crunchy tea-time snack. I can't wait to get settled and start cooking again! 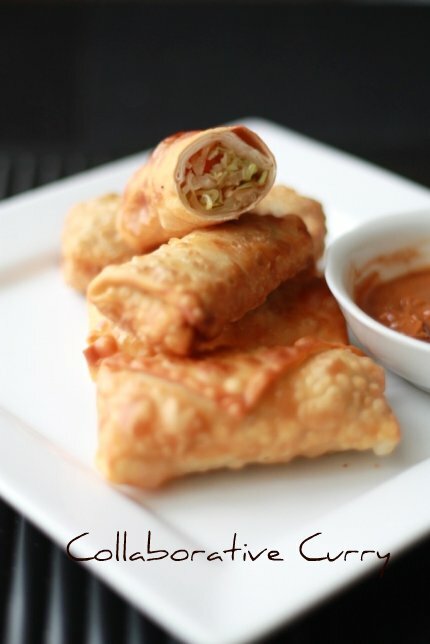 These egg rolls look absolutely delectable! Looks cooool with crispy wraps,, i like the stuffings cabbage it will tastes good while taste it.Its good for evening appetizer can do it easily.thanks for sharing dear...Take Care. I know the rolls Chinese, but I had never seen so beautiful! Thanks for ur feedback. Lovely rolls! Egg roll looks fantastic and yummy, mouthwatering pic. Egg Roll looks fabulous.. Pics look so tempting that I can almost touch them. Wonderful Snack and a tempting click! Love your pics! Also, I like how you made them with simple and minimal ingredients. I always add a bunch of extra stuff in mine and while they are good, there is just something great about a basic veggie egg roll- I am going to bookmark this recipe. 1 have seen chinese spring roll but never came across this egg roll...are they the same? lovely picture of the egg-rolls! look so delicious.